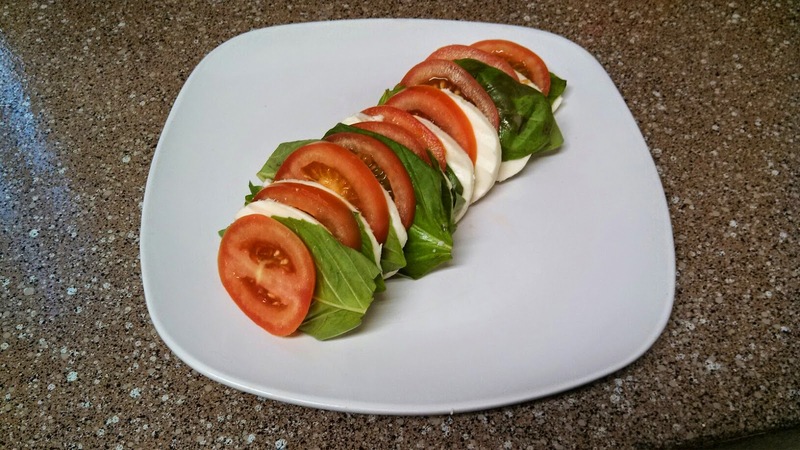 Caprese, a classic, flavorful, and super simple salad. This one of my favorite summertime dishes and I always find myself wanting more. Caprese is comprised of tomatoes, fresh mozzarella, fresh basil, salt, pepper, olive oil, and a splash of balsamic vinegar to finish. The real trick to caprese is cutting the fresh mozzarella and the tomatoes the same thickness. First, a sharp knife will help alleviate most of those issues right away. If you are having trouble with a straight edged knife when you are cutting tomatoes, grab your serrated bread knife and that will help keep the tomatoes from exploding and your kitchen looking like a scene out of a bad horror movie. Try to keep the tomatoes and mozzarella thin, you don’t want them to fall apart, but they should have enough structure where the tomato can support the mozzarella too. If you want them thicker, that is totally okay, but the idea here is that you can have something that isn’t super heavy and doesn’t weigh you down. Alright, lets look a few photos. I have included a couple of photos so you can see how it might look before and after you have dressed the salad. Here is one layout. Again, to finish just dress with a few drops of olive oil, balsamic vinegar, and some salt and pepper. If you are trying to figure out how much oil you need, I might suggest that you pour some oil into a small bowl and use a spoon to let some oil stream off the tip of the spoon. The goal is to have a little bit of the dressing with each bite. If you have spots that aren’t dressed that is okay, just make sure there is some on a bite near by so each bit is properly seasoned. Above you see a plate of dressed caprese salad. This makes for a really flavorful but light lunch, a special occasion appetizer or dinner salad, and it is an excellent choice for anything from a potluck to a backyard BBQ. I have used it for all these applications and not only is it a crowd-pleaser, but it also looks beautiful when plated and dressed. Looking to wake this up a little more? Pair with a nice wine — you could go with a chilled white or a bold red, personal preference is key here. Also, go to your local bakery or favorite grocery store bakery and grab a nice french or sourdough baguette. Slice a few pieces on the bias and you can serve up one stack of the salad on top of the bread. If you are looking for a little crunch, you can also toast the bread in a pan or on the grill. Again, I promise, this will be another dish that you reach for anytime you are looking for something a little out of ordinary. Enjoy!